Winter Swell, Porthleven by Andrew Giddens. I love Porthleven, having spent many hours surfing off the reef in years gone by. I feel inspired to paint and have a first hand experience of the power of the winter swell, along with the sharpness of the rocks! The canvas size for this piece is 174cm wide x 112cm high. I have always enjoyed painting larger scale and I am finding myself choosing to ‘go big’ more often in recent months. The subject matter of the sea really deserves some space to give myself the best chance of doing it justice. 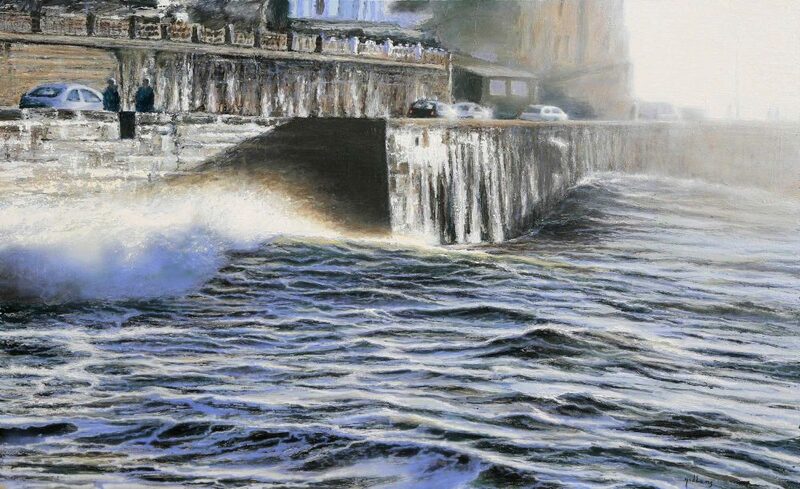 Winter Swell is the first in a series of paintings of Porthleven. My aim is to capture an impression of the raw power of the sea in juxtaposition with the fragility of our lives. And as always to portray the beautiful, clear Cornish light. Have you got any watercolour paintings of cottages in cornwall,preferably around st Ives, mousehole, if not any thatched cottages in cornwall. Sorry I don’t have that!